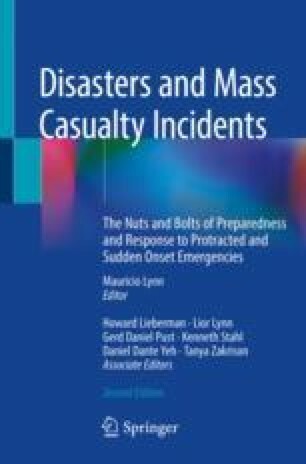 As discussed previously, catastrophes can be diverse and range from natural sudden onset disasters such as hurricanes and earthquakes, to man-made sudden mass casualty incidents (SMCIs). Research shows that man-made SMCIs have a higher prevalence of posttraumatic stress disorder (PTSD) and other symptoms as compared to natural disasters. SMCIs can be overwhelming, devastating, and life threatening for individuals directly affected and others that are indirectly affected. This is true for survivors of SMCIs, the families of survivors, or communities that are grieving, living in fear, or attempting to rebuild. Handling the mental health of each of these groups is vital, as well as knowing how to differentiate between the processing abilities of these events by survivors at the extremes of age, such as the elderly and in particular, children. Specific to youngsters, it is important to identify their developmental stage, the cultural context, and atmosphere in which the children grow up and live, and the type of event (acute vs. chronic; natural vs. man-made). These variables are important for mental health-care providers when protecting against psychological harm.